We have tried to grow pumpkins for the past several years and have always failed miserably. Our first attempt consisted of digging up an area out in our field to plant a pumpkin patch. The heavy clay soil was unfortunately not very amenable to pumpkin-growing. Frustrated, we moved the pumpkin patch next to the barn. Although the soil was extremely fertile as a result of years of composted manure, it seemed that we either watered them too much or not enough. Another failure. The following summer our mischievous free-ranging chickens pecked all the pumpkins when they were young and tender, either completing destroying them or leaving them scarred and deformed. We tried to outsmart the girls and fenced the pumpkins off with a low fence, but they still occasionally hop the fence to snack. Last year, some type of insect started to attack our pumpkins in the fall just as they were ripening and we lost most of them. I wish I had taken pictures so that some other gardener out there could have helped me identify the culprits for future reference. Even after all these failed attempts, we did not lose heart. 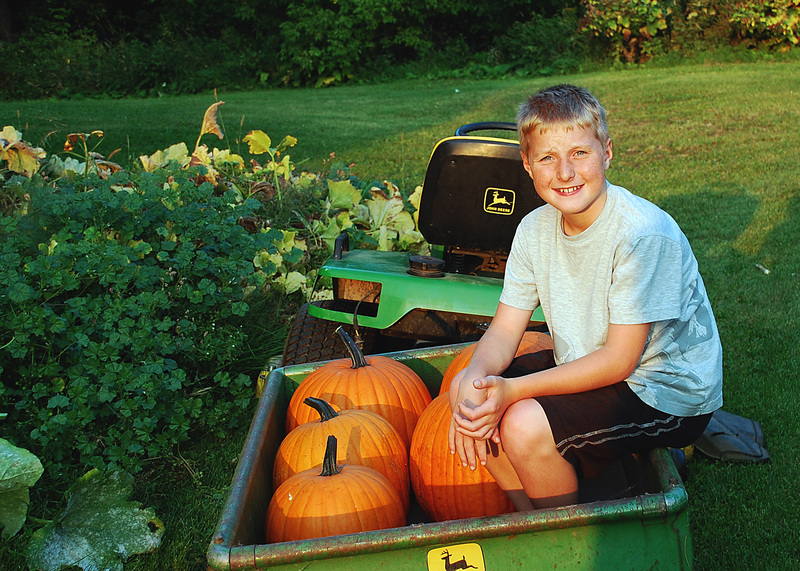 In spring of 2009, we once again planted several mounds of Gurney’s “Giant Magic” pumpkins. Trying to heed the advice on the back of the seed packet and from gardening books, we tried to remember to pluck off a few of those blossoms along the way so that the plants focussed their energy on fewer fruits. And finally….FINALLY…some success. 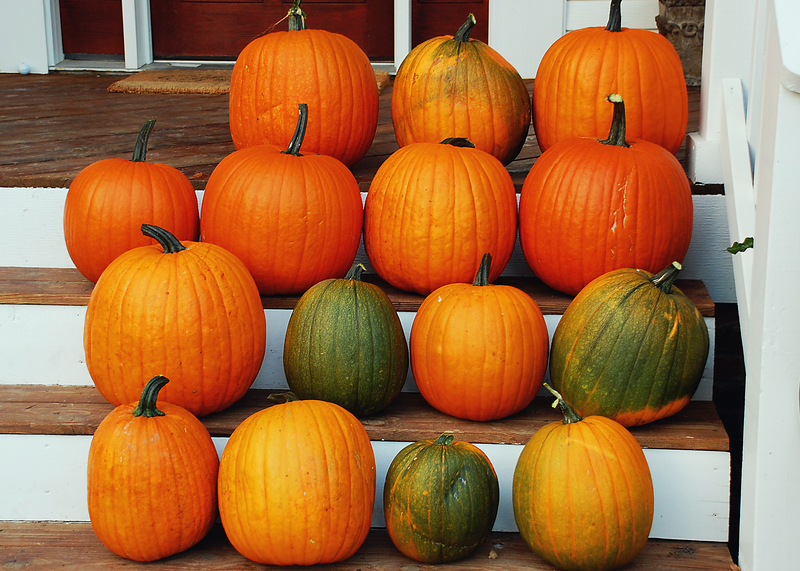 While I realize that these pumpkins are not perfect specimens, we were delighted with the harvest after all of our past failures. At the end of the day, we are just two realistic farm kids. 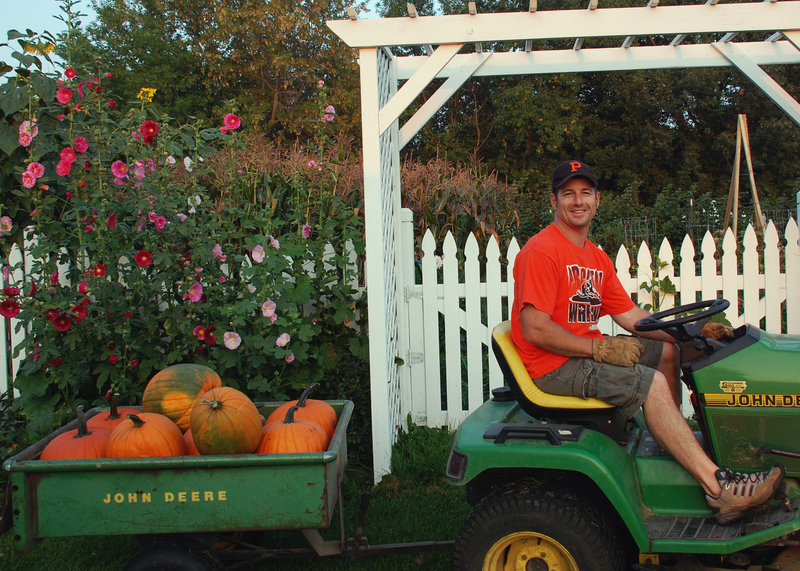 Like the crops grown on our childhood farms, we realize that our pumpkin success this year is only partly due to our evolving gardening skills and adaptations over the past few years. The rest of the equation is merely the whim of Mother Nature and just plain luck. Were the bugs silvery grey? I had a very nice pumpkin patch and I too followed gardening advice full sun, not too much moisture, pinch off some blossoms. Yet my patch started to wilt. A close inspection revealed squash bugs. Yuck! Now researching an organic way to prevent them in next year’s garden.